Support and promote access to all aspects of arts and culture in every county community, developing programs to meet needs countywide. 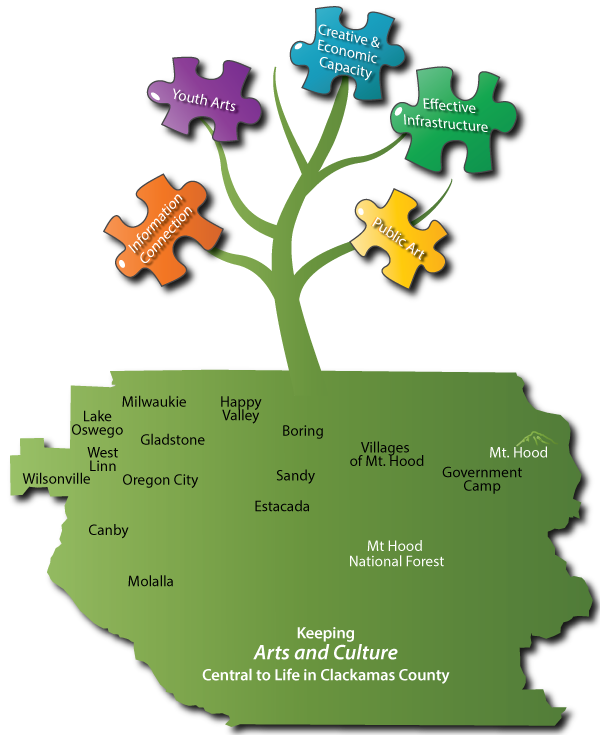 To keep arts & culture central to life in Clackamas County. 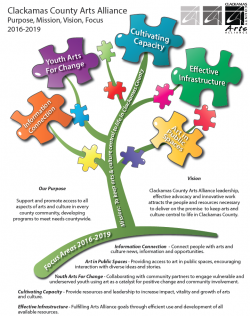 Clackamas County Arts Alliance leadership, effective advocacy and innovative work attracts the people and resources necessary to deliver on the promise to keep arts and culture central to life in Clackamas County. We exist in a future where Clackamas County is full of diverse, vibrant arts and culture which is accessible to and reflects every distinct community, touching each resident wherever they are… from mountain hamlets to riverside villages, from suburban cities to rural farms. Festivals, public art, performance spaces, youth arts education and cultural heritage opportunities are present everywhere. Our county is home to a dynamic network of established artists in all media and offers a uniquely fertile environment for fostering the emergence of new artists. We have a mix of well-known arts and culture attractions as well as hidden gems ripe for discovery. By 2019, our collaborative efforts with partners are creating magnet cultural destinations infused with arts assets attracting a wide variety of visitors. The Clackamas business community, local and county governments, elected officials, arts patrons and residents all understand the critical role arts and culture has in driving economic benefit and building healthy, vibrant communities. They all demonstrate their support through financial investment in artists, actors, musicians, writers, theaters, libraries and other cultural organizations, opportunities and creative people. Effective advocacy to increase public investment in arts as a vital element of strong communities. Our network of artists, art supporters and partners actively communicate the impact of Arts Alliance work and as a result, we consistently attract the people and resources necessary to deliver on the promise to keep arts and culture central to life in Clackamas County. Provide resources and leadership to increase impact, vitality and growth of arts and culture. Providing access to art in public spaces, encouraging interaction with diverse ideas and stories.